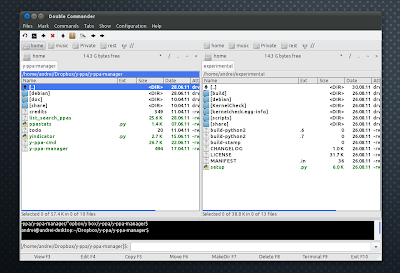 Double Commander is a very interesting cross-platform file manager inspired by Total Commander (it even supports Total Commander plugins). It uses two panels side by side and comes with a huge feature list: tabbed interface, multi-rename tool, embedded terminal, internal text editor and file viewer, browse archives (ZIP, TGZ, LZMA, RPM, RAR, DEB, etc. ), extended search and is fully customizable. All Double Commander versions have the "beta" status and there's a reason for that: some features are not complete, like the new FTP feature which basically lacks all the options one would expect it to have except... connecting to a FTP server. And you'll probably encounter a few bugs too. But even so, if you like a dual-panel file manager, give Double Commander a try because despite these issues, it's a really great application. For other Linux distributions or Windows, check out the Double Commander download page.